How to make a monumental post war building futureproof ? Dutch housing cooperation Eigen Haard took up the challenge successfully: their model is now widely adopted by others. Between 1949 and 1965, 10.000 Nemavo-Airey dwellings were constructed in the Netherlands, half of them in Amsterdam. As the small apartments (40-60m2) and the poor insulation do not fit today’s expectations anymore, many of them were demolished. On the other hand, in some cities including Amsterdam, some of the complexes were listed as a monument, typical for the post war reconstruction period. In fact, the Airey complex along the Burgemeester Van der Vlugtlaan is the heart of the Van Eesterenmuseum, celebrating post war urban design. What is so special about these concrete buildings anyway? Post World War 2, Europe started to rebuild its cities. The scarce availability of resources combined with this huge task to provide homes quickly and in large numbers, asked for a radical change in the building industry. One of the people taking up this challenge was the English engineer Sir Edwin Airey. He developed an innovative prefab system with standardized floorplans and prefab elements which allowed to construct rows of single family houses quickly and efficiently. In the Netherlands, Nemavo used this system also to build small apartment blocks. The prefab elements were small and light enough to be placed without the use of machines or cranes. The skeleton was made of a combination of concrete and steel, with minimal dimensions. 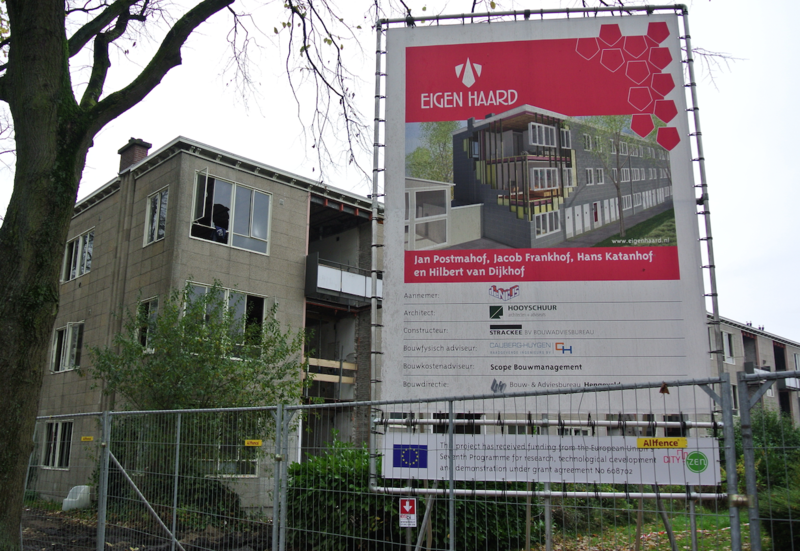 Housing corporation Eigen Haard, with financial support from the European Commission via City-zen, took up the challenge to renovate 140 apartments. But retrofitting such a building to contemporary thermal and soundproofing standards is not straightforward. The minimal dimensions of the building shell proved to be an extra challenge. The inner cavity wall was taken down, so for the first time a firm layer of insulation could be placed between and behind the concrete skeleton. New, well insulated fronts and windows replace the draughty steel ones. The installations are completely renewed and the apartments are equipped with a mechanical extraction system. Fortunately, strength calculations showed that the roof could carry 6 PV panels per household. These PV panels will be rented out to the tenants via an external party HuurdeZon, allowing Eigen Haard to allocate their investments to the building itself. After the first two stages of 140 dwellings in 2016, Eigen Haard decided to continue with the renovation of another 80 apartments, starting in early 2017. The social and technical approach has been shared with other housing corporations in Amsterdam, who now start to adopt this for similar buildings in their portfolio. By working together the housing corporations will be able to keep the costly and strenuous forced relocations of tenants to a minimum, by assigning tenants an already renovated apartment in one of the blocks in the neighbourhood. The renovation of the first building is now almost completed and the first tenants will return to their homes by Christmas 2016. Via City-zen the European Commission supports the energy efficient renovation of 52.000m2 in Amsterdam and 36.000 m2 in Grenoble. The renovation of the Airey Buildings is one of the selected projects.